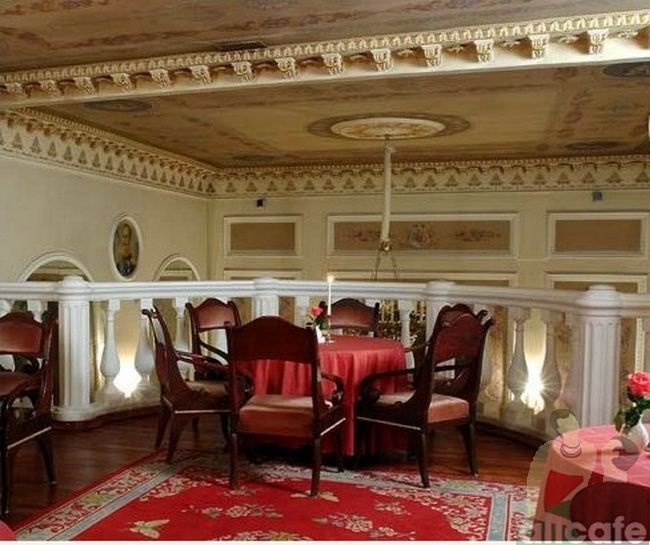 The preferred restaurant of the city’s most prominent citizens, in cuisine, service and setting Dvorianskoye Gnezdo is comparable to the best fine-dining establishments anywhere in the world. Situated at “Theatre Square” in central St. Petersburg (with the famous Mariinsky Theatre and Kirov Ballet and Opera companies near by), Dvorianskoye Gnezdo was originally the luxurious “garden pavilion” of the Yusupovsky Palace. Restoration of the pavilion was a painstaking two year project involving an international team of architects and renovators. The exterior was returned to its former grandeur while the dilapidated interior was completely remodeled to accommodate a modem international restaurant. Classical white columns support the terrace, enhancing the soft tones of the two dining rooms each accommodating 25 guests. The furnishings, table settings and wine displays — all of the highest quality -complete the “noble” atmosphere. Space restrictions determined the floor plan of the compact-yet extremely capable -kitchen. Under the strict control of a foreign head-chef, the Dvorianskoye Gnezdo kitchen prepares cuisine that is unique and memorable, “New European cuisine” with inspiration from traditional Russian delicacies. The beverage menu is unequaled in St. Petersburg with the finest imported wines and cognacs, served both at table and in the mezzanine lounge bar. As a lunch – time business venue, to the city. Dvorianskoye Gnezdo is favoured by a distinct clientèle.